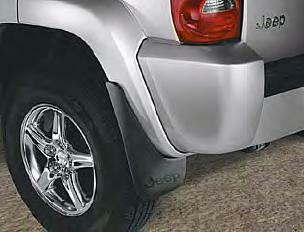 Deluxe Molded Splash Guards for the 2002-2007 KJ Jeep Liberty provide excellent lower body protection and accent the vehicle styling. Made of a composite of TPO plastic and TPR rubber to be rigid yet forgivable and paintable. 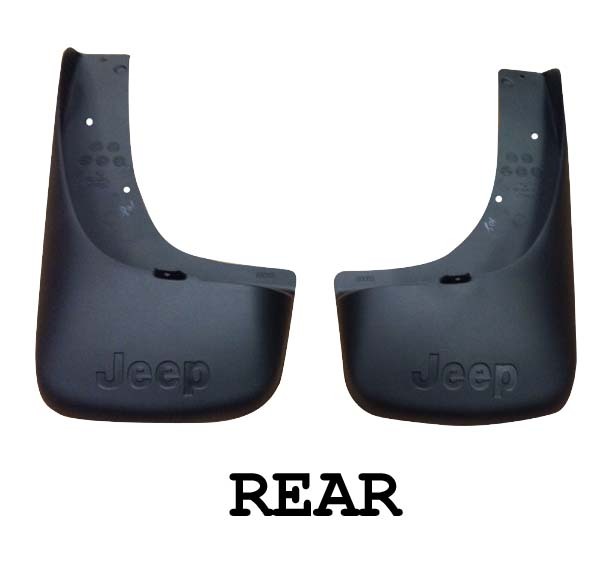 They are molded to the contours of the vehicle for a custom fit and features vehicle logo (depending on vehicle application). Black, rear set, except Renegade. Please select type and color above. Installed easily and are working well. I can now see out my rear window! I travel a lot on dirt roads, and when they get wet from snow and rain the rear tires kick up a muddy mixture that coats my rear window, reducing my vision to the rear widow to zero. Even with a wiper and windshield solution it was a losing battle. With my new splash guards, I'm winning the battle. They are great, l should have had them put on long ago. Thanks to "Just for jeeps" I have the right product, perfect fit. ProsThey went on easily and look great! Great product and good value! !